Steve Siegel – I started Harbor West Weimaraners in 1988 as a continuation of my love and admiration for the breed that began when my parents got our first Weimaraner when I was 11 years old. 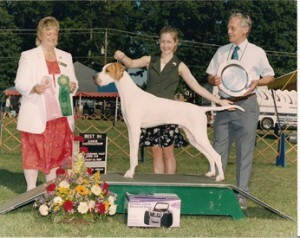 I got my first taste of the breed and obedience rings then and I became hooked on the versatility of the breed. I also began to understand the training and commitment that goes into preparing a dog for competition. When I had my first litter in 1991 I realized that the commitment level had to be increased many times over to be a successful breeder. One of the greatest parts of being a breeder is seeing your puppies go out in the world and bring the same joy and happiness to other families as they have brought to me. Seeing these puppies become loving members of their new families as well as seeing their accomplishments in the ring and in the field makes all the hard work worth it. Working with Melissa for several years now has allowed me to pursue a new career as an AKC judge while keeping our breeding program moving forward. If you have any questions or comments please do not hesitate to contact me or Melissa as we would be happy to share our experiences with you. Melissa Hampton – My family purchased our first Weimaraner and my first dog ever in 1993, from Joyce Wirt of Telmar Weimaraners, when I was 9 years old. Soon after, I joined a local 4-H club and started to train Greta in obedience and junior handling. We were very blessed to have two wonderful litters by Greta of 9 and 11 puppies out of Ch. Aria’s Alladin of Telmar. These two experiences were an absolute dream being a young girl and having so many new four legged friends around, but I also learned a great deal about the responsibility of breeding and raising dogs. This only escalated my love of dogs and I became involved in AKC events shortly afterwards. Although Weimaraners are my first love, my pointer Taylor (Ch. 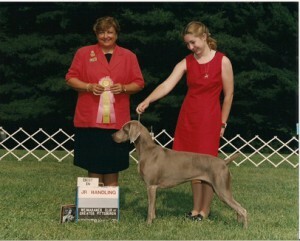 Dogwoods Causin A Storm) was my first show dog who I finished and competed in Junior Showmanship with. I met Steve in 2000 while searching for a new companion to show in Juniors with and entered Ch. Smoky City Harbor West C-Note “Carly” who joined my family. Steve and I have continued to co-own, breed and handle our beloved Weimaraners under the kennel name Harbor West and look forward to the future. 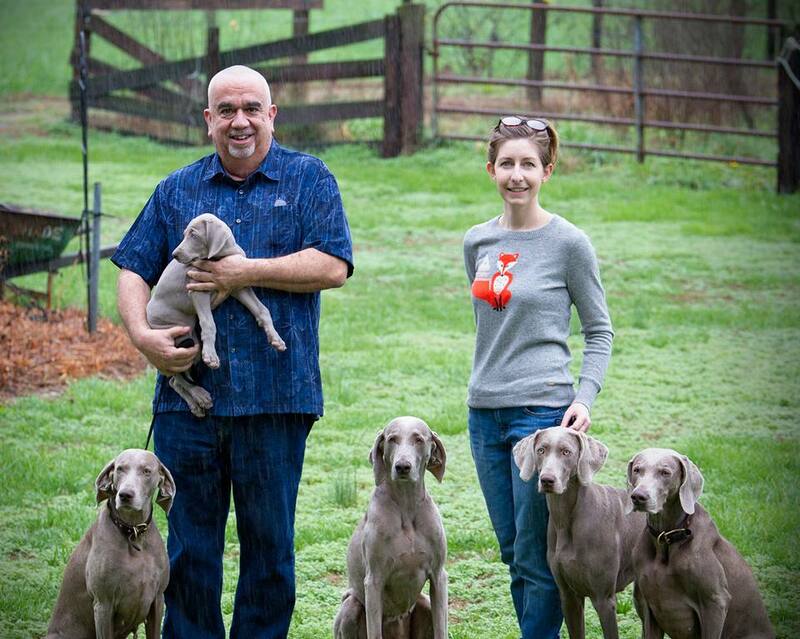 Steve and Melissa are both members in good standing with the Weimaraner Club of America, and Melissa is currently a member for the Salisbury Maryland Kennel Club, Delmarva NAVHDA and the Delaware Valley Weimaraner Club.